Democrats Barack Obama and John Edwards sharply challenged Sen. Hillary Rodham Clinton's candor, consistency and judgment Tuesday in a televised debate that underscored her front-runner status two months before the first presidential primary votes. Clinton defended her Senate vote in favor of designating Iran's Revolutionary Guard as a terrorist group. Obama, Edwards and others have said President Bush could interpret the measure as congressional approval for a military attack. "In my view, rushing to war - we should not be doing that - but we shouldn't be doing nothing," Clinton said. "And that means we should not let them acquire nuclear weapons, and the best way to prevent that is a full court press on the diplomatic front." Clinton replied forcefully, saying "I stand for ending the war in Iraq, bringing our troops home." She added, however, that "it is going to take time," and some troops must remain to fight al Qaeda in Iraq. "I don't know how you pursue al Qaeda without engaging them in combat," she said. Edwards, drawing a link between Iraq and Iran, pressed on. "What I worry about is, if Bush invades Iran six months from now, I mean, are we going to hear: 'If only I had known then what I know now?"' 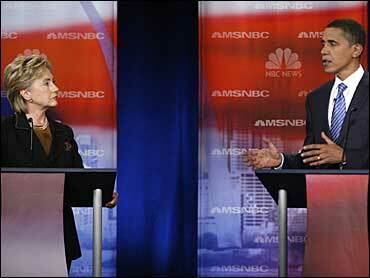 He was alluding to comments Clinton has made about her 2002 vote to authorize military action against Saddam Hussein. But Edwards and Connecticut Sen. Chris Dodd cited Clinton's relatively high unfavorability ratings. "Fifty percent won't vote for her," Dodd said. On Social Security, Russert asked Clinton why she told an Iowa voter, in an offstage comment overheard by an Associated Press reporter, that she was open to raising the cap on payroll taxes when the proposal is not part of her platform. CBS News senior political correspondent Jeff Greenfield said that was probably the most uncomfortable moment for Clinton during the debate. "We're going to find out if that pretty clear stumble was just a flicker or something more, but I do think this was the first debate I watched where Senator Clinton seemed a bit off her game," Greenfield said on CBS News' The Early Show.